For the Sunday night return fixture, Nicole Jackson was selected in goal, with Bobby Caunce also returning. Chris Preston was unavailable. A big crowd including a sizeable Widnes following, saw the game open in lively fashion, Filip Supa being sent clear for Wild and Josh Nicholls making a good block. Almost immediately, played switched to the Widnes end - Nicholas Ottoson weaving through the defence and from behind the net he fed Thomas Soar who opened the scoring at 2.26. An error in the Widnes defence saw the same players combine for Soar to score from close range to put the Barons 2- 0 up at 6.42. At 10.12 Kieron Papps added a third, firing low past Nicole Jackson from directly in front of the net. Despite a three goal deficit , Wild were looking to play good attacking hockey. Bobby Caunce broke clear down the right before feeding Filip Supa who fired low past Nicholls to open the Widnes scoring at 14.43. In a hard fought second period, Barons were the only scorers, when following a defensive error, Soar found Eddie Eaton for a simple tap in at 21.56.Dan Bracegirdle didnt come out for the second period after sustaining a hand injury. Wild continued with their effective counter attacks. Just a minute later Filip Supa was sent clear down the right, only to see his angled shot flash by the right hand post. Two minutes later, young George Crawshaw, again in impressive form, broke through and after seeing his first shot blocked, followed up, only to see his back stick shot clawed away from just inside the right post. 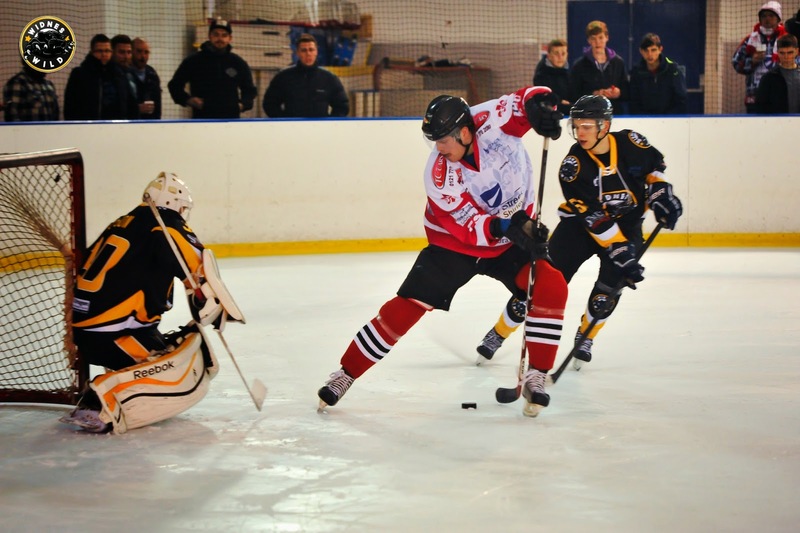 After Bruce received a ten minute misconduct penalty and Sam Dunford took a debatable kneeing call, the latter player returned to the ice to break clear and see his powerful shot saved by Nicholls. Again Crawshaw got clear to bring a fine close save from Nicholls, who then made several successive saves as the period drew to a close. An incident involving Perry Doyle near to the Wild bench, brought the second to a close. Within seconds of the restart, Barons effectively settled the game with Ottoson feeding Soar who hit a one timer low into the net. Two goals inside three minutes from Soar at 45.21 and Joe Henry at 47.44 put Solihull further ahead. Wild continued to press with Supa and Pollitt going closest for the visitors. The never say die attitude of the Wild team was well summed up by Lee Pollitt chasing Ottoson all the way from the red line to prevent the overseas star adding an eighth. This was another fine all round effort from Widnes with the final score not reflecting their contribution to an all action game. Ken Armstrong took the MVP for Wild with Thomas Soar taking the award for the home side. The team enjoy a rare break before returning to home ice for a vital match with Nottingham Lions on Saturday January 31st - face off 5.30 pm.